Foreboding tunnels, rickety mine trains and crotchety old prospectors. That’s what most people think of when they envision a mine. Mines are the stuff of the unknown; sometimes scary, sometimes mysterious. But at the Carthage Underground, a sprawling former mining operation space in Carthage, Missouri, the reality of life at a former mine is vastly different. Here, hundreds of warehouse and office employees spend their days below the Earth’s surface. There are even rental facilities for special events and a private tennis club. 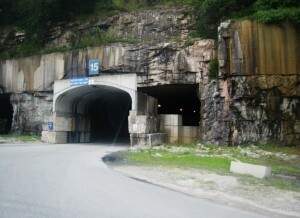 The entrance to the Americold underground storage and distribution facility. 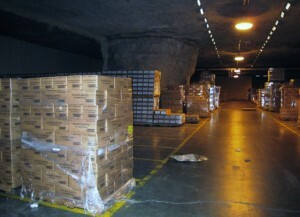 Most of the land above and below ground at Carthage Underground is owned by Atlanta, Georgia-based Americold, a global leader in temperature-controlled warehousing and logistics. 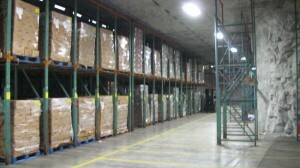 Americold’s Carthage warehouse operation is indeed impressive, with 69 truck doors, rail service and refrigerated docks. In addition to temperature-controlled warehousing, the site offers blast freezing, labeling and pre-ticketing, inventory management, pick and pack, manufacturing support and USDA inspection, just to name a few of their value-added services. All told, Americold has 2.8 million square feet of storage space at its Carthage site. But the challenge was being able to take full advantage of the cavernous vertical space – all 28.8 million cubic feet of it. That’s where Winter Springs, Florida-based Outsource Equipment Company comes in with their pallet racking solutions. But Smith and his team were able to come up with some pretty impressive pallet racking solutions for Americold. “Before we came, they were only able to store about 4,000 pallet positions – and even some of those weren’t working out very well for them because of the double-stacking; they were having some product damage,” Smith states. “We essentially doubled the amount of their pallet storage in there, creating 6,872 pallet positions of drive-in and selective pallet racking in four different underground freezer rooms. And with the racking, they now are able to choose the pallet they need without the double-handling that occurred when they were double-stacking.” Creating this solution for Americold wasn’t a walk in the park, though, because this isn’t a typical warehouse space. The bottom line is that Outsource Equipment was able to nearly double Americold’s storage capacity. What’s more, Outsource Equipment saved Americold 50% off what it would have cost to install all-new racking throughout the facility. Because Outsource Equipment was able to modify and reuse some pre-owned racking, they were able to create a solution of new and used racking that saved money and is environmentally responsible. Contact Outsource Equipment today if you need pallet racking solutions!